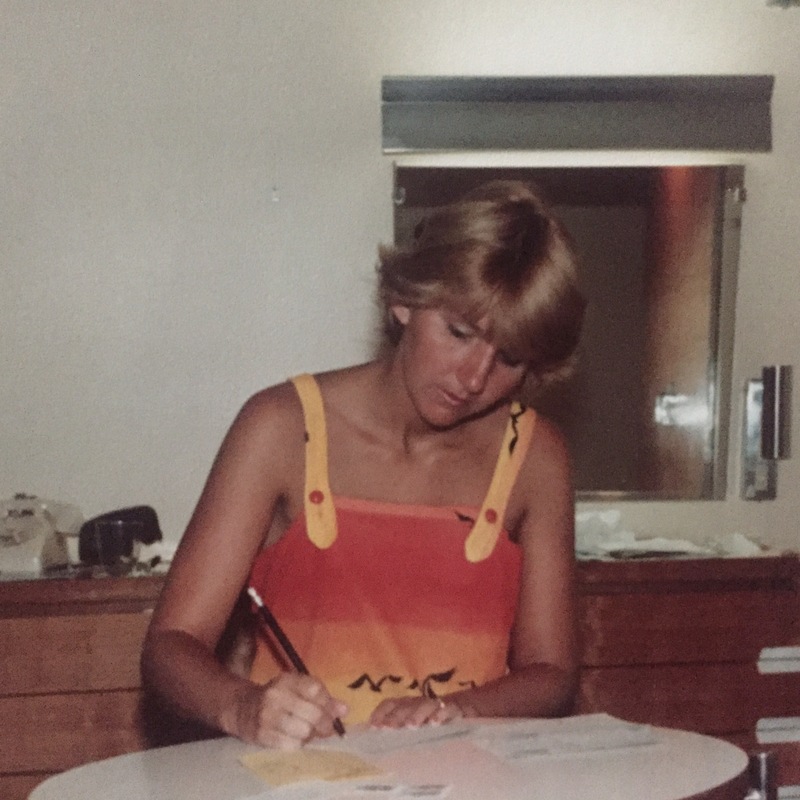 In spirit of my mom’s birthday this upcoming Sunday, I want to honor her and what would’ve been her new cycle around the Sun with a special post. I’ve seen hundreds of photos of my mom over the years, smiling and posing in front of the camera. Whether she was in good health or bad, she never would shy away from dazzling a smile and capturing a moment. But this candid photo where she’s in her element is undoubtedly my favorite photo of my mom. When I see this photo, there’s this veil of mystery shrouding my mom. For every one observation I can gather about my mom, there’s another handful of questions that come to my mind. For instance, my mom is writing a postcard, but who is she writing to? My mom’s facial expression looks as content as the mind’s eye, but is she content, deep in thought, lost in thought? My mom was on her honeymoon in Martha’s Vineyard, but was she worried about her future, excited? What did she think her future would be? When she was daydreaming, what would dance inside her head? A few months ago, a co-worker of mine insisted that I read an article in the New York Times. Titled, “Our Mothers as We Never Saw Them”, the article details a photo series where daughters submitted photos of their mothers from before they were born, and more specifically, when they were in the prime of their youth. As I was reading the article, and looking at the photos, I instantly remembered this photo of my mom. The myth surrounding my mom would always be there, even if she was alive. After all, there is a certain suspended sense of reality surrounding mothers everywhere. The photos of them where they were young give life to that suspended sense of reality. We hear loosely told stories about our mothers but the words tend to dance around in our heads like folktales in a way. We know the stories at face value, but can we truly imagine how they happened? Could they have even happened? There almost tends to be this sociocultural belief that our mothers lived two lives: The life before kids and the life after kids. Somehow connecting these two bifurcated lives is like a game of mental gymnastics. It’s as if creating a continuous narrative of our mothers is like a tremendous feat that shatters this idea that we’ve fabricated in our lives of motherhood. And the nexus of these bifurcated lives is when our mothers are in their twenties – burgeoning with innocence and fear and love and passion and most importantly, the tipping point of youth. However, my mom’s absence in my life only heightens the myth of her youth that much more. The stories that I hear all come from the third person perspective,”Your mother loved this,” or “There was this one time where your mother and I…” or “Her favorite movie was…” or “She always hated it when,” and well, the list goes on and on. The stories surrounding her life are like quickly popping kernels of popcorn piecemealed together in thin air. I grapple to make sense of them all. There’s something about photos like this, at this time of her life, that captivate my curiosity. She was a woman before cancer. In fact, she was a woman before kids. She was a young woman like me, with a whole world in front of her, and a limitless amount of new days in her horizon. Her life was virtually halfway over in this photo, but that didn’t matter. It couldn’t have mattered, I mean look at her tanned skin, her dreamy eyes, her dazed yet sharp focus on her mind’s eye, writing letters, thinking about her loved ones or the day in front of her. I’ll never know what was happening at the exact time this photo was taken. My mother’s youth is part myth and part legend – containing hints of truth, but otherwise embodying a lifetime’s worth of speculation. At least I have the photos to remind myself of a reality that once was, that it’s not all piecemealed popcorn kernels jumbled in my brain. She was just as real as I am real, just as full of spirit as I hope I am right now. My mom, she was a mother, but she was a woman. She lived a life that carried with her into motherhood, and into cancerland. I’m greatful for any of the artifacts I can find that tie these pieces together and turn her life and legacy into a fluid one, full of ups and downs that extend within and beyond motherhood.